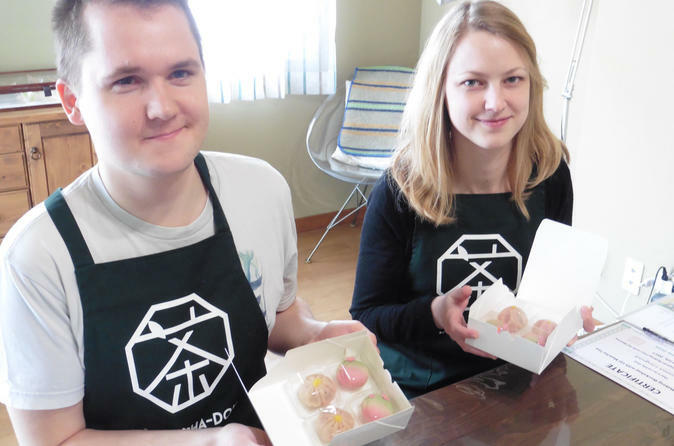 Learn about the traditional way to make wagashi (Japanese sweets) and gain some valuable insight into Japanese culture in this 2.5-hour workshop and tea ceremony. Sample wagashi accompanied by matcha (Japanese green tea) and bring your hand-made sweets how to enjoy afterward. The instructor will walk you through step by step to create these beautiful pieces. The sweets are even challenging for Japanese as it requires various steps and techniques such as making An (black bean paste), coloring, shaping and decorating. Sure to be an unforgettable part of your experience in Japan! In the morning or afternoon, meet your interpreter outside a specified train station, who will then accompany you for a 5 min walk to your wagashi making class. Listen as the instructor gives you a thorough explanation on how to prepare the sweets of the day. The recipes and the notes are also provided in English and the instructions are fairly easy to follow. Now, get ready to prepare two or three kinds of seasonal sweets, beginning with the dough-making, moving on to the coloring and shaping, and, finishing with the designing. Following a short tea time — with a bowl of matcha and sweets previously prepared for your by the instructor — pose for photos with your group and instructor and conclude the workshop. Take the sweets you made with you to enjoy later and accompany your interpreter back to the train station. Please note: A minimum of two people per booking required.